Single? It’s Complicated? Friendzoned? This Café Is For You. Whether you’re bitter about being single or trying to recover from heartache, Hugot Café has everything you’ll ever need. If you need to talk it out, the café has an Open Mic every Saturday or Sunday. Registration is at 5 p.m. and performances start at 8 p.m. Go channel your inner Juan Miguel Severo! If you need to eat your feelings and if your love for chocolate runs deep, as in the-depths-of-your-soul deep, we highly recommend the Paasa or Pa-fall Milkshake. Not in the mood for a milkshake? They also have the Kapeng Matapang Kaya Kang Ipaglaban, guaranteed to snap you out of that funk. 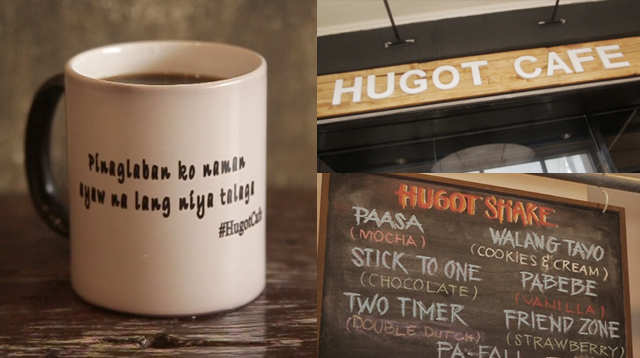 Barkadas have traveled from as far as Pangasinan just to visit Hugot Café! What are you waiting for? Check out Hugot Café's Facebook and Instagram for more information.